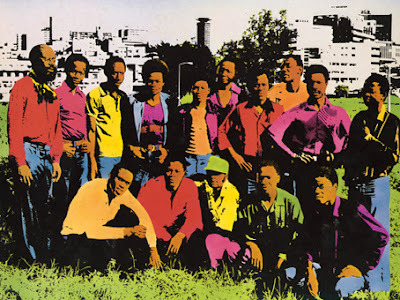 Mzee Makassy formed the band Orchestra Makassy in Uganda and in 1975 the group left for Tanzania and took up residency at the New Africa Hotel in Dar-es-Salaam. Mose Se Fan Fan, a solo artist at the New Africa, joined the band and together they recorded a number of tracks for Radio Tanzania some of which turned up on a Retroafric compilation. They also recorded an album for Virgin records in Kenya but soon after the LP was released the band fell apart, with Mose Se Fan Fan and Remmy Ongala forming their own splinter groups. A reissue of Makassy's material focusing on the Agwaya LP recorded for Virgin did find its way to CD a while back. Unfortunately the care taken by labels such as Blood and Fire, Numero, Soundway and others was missing and a number of song titles were incorrect and tracks that should have been on the release were omitted. Anyway all this is beside the point. What I wanted to share with you today is the recording that will always be key to unlocking my heart to African rumba - Makassy's cassette recording that was passed on to me from Jumbo at Eathworks in London in 1983. Enjoy! For further information on Congolese bands in East Africa check out Alistair Johnson's MUZIKIFAN. Yes, Jumbo was the man — along with Trevor Herman, of course. Probably the two individuals who did the most to nurture my interest in African music — and my early collection. It's good to remember them. Thanks as always to you, Matt. what site is built on friendships,free music,and supports all indie artists? Nice to hear these versions of the songs I know from their Virgin lp. I remember an interview with the English producer of the Virgin lp who asked some bandmembers to play a part alone upon which the band protested saying "why should he play alone, there are 20 of us in the band"
Which song titles are incorrect? And I'm curious as to what additional Makassy songs you would want that are not already available. 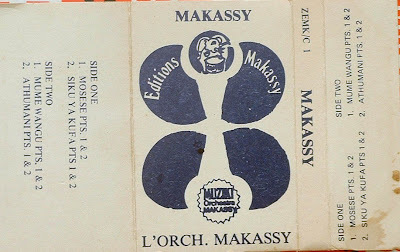 The Makassy reissue should have been a two CD affair with the Radio Tanzania tracks on CD1 and the Agwaya sessions on CD2. The reissue had the song Chama Cha Mapinduzi retitled Muungano. The booklet had scarce detail on the band and the design was average. Have a look at the labels Soundway and Numero for an idea of how reissues should be done. The makassy you posted last january was the best, for me. I believe those were RTD recordings. Unfortunately i have lost mine courtesy of a virus and the mixing of what we have now is a bit cumbersome besides not having molema and mambo bado. Sorry, i meant january 2007.